More than 400,000 visitors each year can’t be wrong: Wilson’s Promontory National Park, on Victoria’s south-east coast, is something very special. Victoria’s oldest national park, encompassing 50,000 hectares of land the southernmost tip of mainland Australia, has pristine beaches, carefully preserved forests and a range of accommodation options. If you’re lucky enough to secure yourself a stay at ‘the Prom’ (school holidays are balloted a year in advance…), Hannah Foster has you covered with the top ten things to do at this much-loved piece of hiking and holidaying heaven. This 19-kilometre (return) walk can be accomplished in a day and takes you through mountains, temperate rainforest and ultimately to one of the Prom’s most beautiful, sheltered and secluded beaches. It’s a huge improvement on what Sealer’s Cove was used for a hundred years ago, when it was the site of significant sealing and whaling activity and later, timber logging. Hiking trail in Wilsons Promontory National Park, Victoria, Australia. Wilsons Promontory Lightstation is super remote, accessible only by sea or a day-long hike from Tidal River or Telegraph Saddle car park. Hikers can stay overnight in one of three of the lighthouse’s cottages. For romantics, the Banks Cottage has a queen bed, private bathroom and uninterrupted views out over Bass Strait. The Prom’s latest accommodation option, these safari-style large permanent tents are situated in a quiet part of Tidal River and are the ultimate in glamping, with timber floors, a queen bed and a communal kitchen for Wilderness Retreat guests. The northern part of the Prom doesn’t get nearly as many visitors, but Miller’s Landing, near the park entrance, is an easy walk with the chance to see flora and fauna you wouldn’t normally associate with the Prom, including large flocks of black swans. An abundance of wildlife calls Refuge Cove its home, with waters in the region that supports dolphins, sharks, seals and migrating whales as well as a rich diversity of bird life, including albatross, shearwater, fairy prions, little penguins and white-bellied sea eagles. We are lucky that departures are daily and you will also enjoy a lunch on board of Refuge Cove Cruises! Why? Because it’s hot chips. On the beach. And because Norman Bay is a wide, white, postcard-ready beach with decent surf at one end and a kid-friendly tidal river at the other. Spotting native animals out in the wild never gets tiring. Around the Loo Errn you’ll most likely see wombats, but also look out for various types of wallabies, echidnas, native swap rats, several types of tiny marsupials and native birds. Pro tip: No matter how cute, never interfere with the wildlife or try to feed them your food, it’s dangerous for you and for them. The hike up this mountain is worth it for the view at any time of day, but seeing the sun set over the ocean, casting pink to golden light across Tidal River below, is something very special. Pro tip: Once the sun goes down it gets very dark very quickly, so take a good torch with you for the walk back down the mountain. Parks Victoria offers a great schedule of academic speakers and kids activities that you can attend while at the Prom. With a long and complex history and amazing biodiversity, there’s a lot to learn. Plus, it’s a good alternative to your tent on a rainy day! Much of the water around the Prom is a marine national park, with seabird colonies, fur seals, leatherback turtles and visiting whales. Full day cruises around the Prom’s coastline are a way to see this unique destination from a different perspective. 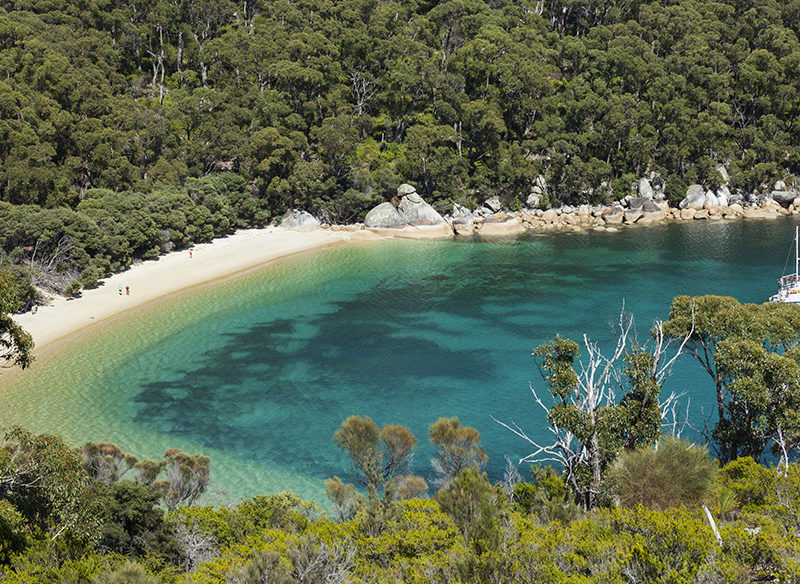 So excited to get to Wilsons Prom, as I’ve heard its one of the most fabulous national parks in Australia. Fraser Island will be hard to beat, but we’ll see! Just waiting for the weather to warm up down south, before we get there! Could be time for a reunion, Chris! If you want to stay close to Wilsons Prom but avoid the crowds of Tidal River, stay at Promhills Cabins just near entrance gate. It’s peaceful, great views with comfy cabins. Hello Prom lovers. I have an exhibition of Wilsons Prom paintings at the St Kilda Town Hall , Aug 19 – Sept 16 2015 , Monday – Friday 8.30 – 5pm. I have been painting amongst the wild winds down there for some years and the work captures the spirit of this majestic landscape. I hope you can make it to the show. Thanks for helping us plan our trip to Wilsons Prom.